Kabocha, sage, & crème fraîche pappardelle // Two Red Bowls. Best of all, in the true spirit of the giving season, I’ll be participating in a couple of giveaways that I’m super pumped about. And the first of them is today! I’m teaming up with some amazing bloggers and Vermont Creamery to give away products from a whole set of stellar Vermont businesses. There’s chocolates, a cake carrier, a French taper rolling pin (that you could use to make this pasta! ), adorable stationery, maple syrup and maple cream, and, of course, a droolworthy amount of Vermont Creamery crème fraîche, goat cheese, and cultured butter. Not only are Vermont Creamery’s products some of the best I’ve ever had, but every one of the lovely people I’ve had the pleasure of working with has been unfailingly wonderful. There’s something special about a brand where it’s so evident that everyone there truly cares about their mission, the quality of their products (all handmade in Vermont! ), and the lives that they touch through their business. 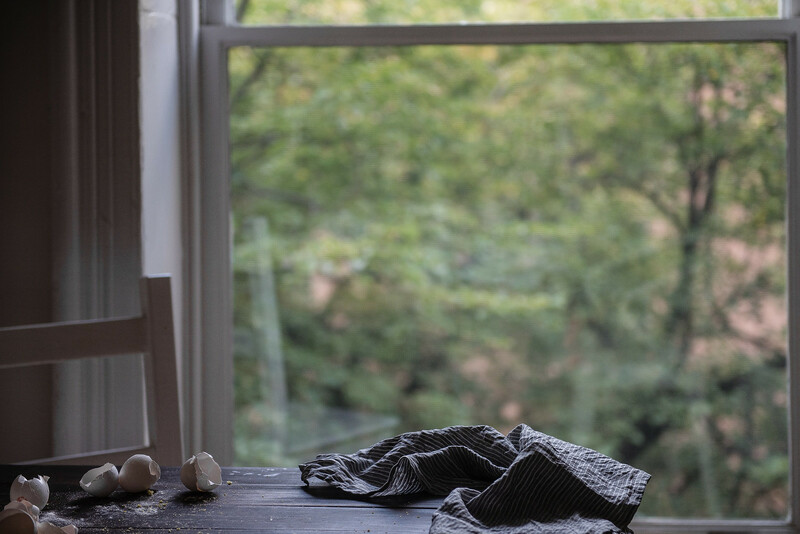 It shows in everything from the unbeatable quality of the products they offer to this thoughtfully curated giveaway. (And I mean, they post cute goat Instagrams.) I’m truly honored to pair up with them. For my contribution to Vermont Creamery’s month-long crème fraîche celebration, I went for a homemade pappardelle. I think every time I’ve made pasta by hand, there’s a moment halfway through where I’m totally, utterly convinced I am not going to make it to the end. It always starts with a false sense of confidence (like, oh, it’s still totally okay I don’t have a pasta machine! Last time wasn’t that hard. I was just sore for like, a day. Two days? Plus, this time I’m using that recipe that’s supposed to be way easier to roll out by hand. So doable!) Then, piles of flour, ten egg yolks and two burning biceps (triceps?) later, I’m dusted head-to-toe with flour and swearing to Bowl #2 and anyone who will listen, this is impossible, I’m not convinced my arms are still connected to my body, tie me to the mast and never let me be tempted by the siren that is homemade pasta ever again. So maybe I need an arm workout or two. But with Vermont Creamery crème fraîche waiting for the sauce, I think it was a little easier (maybe?) to soldier through this time! And in truth, there’s just something so beguiling about seeing your own handmade, sunny-yellow noodles bobbing merrily to the top of a pot of boiling water, looking just like something you previously never thought you’d be able to make yourself. Here, I used an adaptation of Jeffrey Steingarten’s tajarin recipe, cut a little wider for pappardelle (and made with, as you might have guessed, a terrifying number of egg yolks). It was my favorite homemade pasta so far — the extra egg yolks do make it much easier to work with, and the noodles that resulted were eggy, toothsome, and satisfying, especially when tossed in a tangy-sweet sauce made from crème fraîche, kabocha puree, and a touch of spice, with a little bit of brown butter and sage for an earthy undertone. I took one bite of this pasta and remembered exactly why — in a month or two — I’ll be willing to give this a shot again. This season I've been trying my hand at different squashes than pumpkin, as much as I love my old standby. This recipe uses kabocha, an Asian variety of winter squash that's almost unfairly sweet -- I loved it. But you should feel free to use whatever puree you have on hand, from a good old can of Libby's to butternut, acorn squash, or delicata. 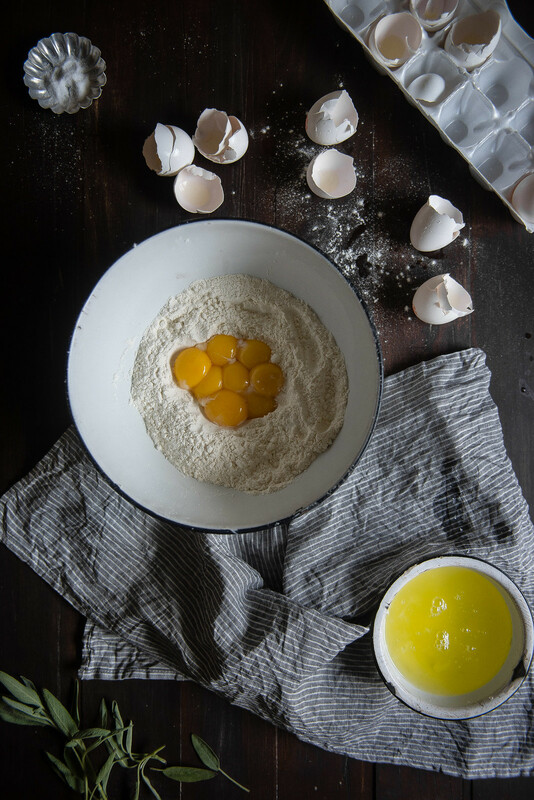 If you're wary of the high number of egg yolks in the pasta, try 2 cups flour and 4 large eggs instead -- though it may be difficult to roll it out by hand to your desired thinness. A pasta machine would be best in that case. And of course, feel free to use storebought fresh pappardelle or substitute your favorite pasta recipe. Combine the flour and salt in a large bowl. Make a well in the center, and add the egg yolks. Stir with a wooden spoon until it comes together into a dough. On a lightly floured surface, knead the dough until smooth and elastic, about 5-10 minutes. Wrap in plastic wrap or place in a Ziploc bag and let rest for 45 minutes to an hour. Cut dough into several pieces. 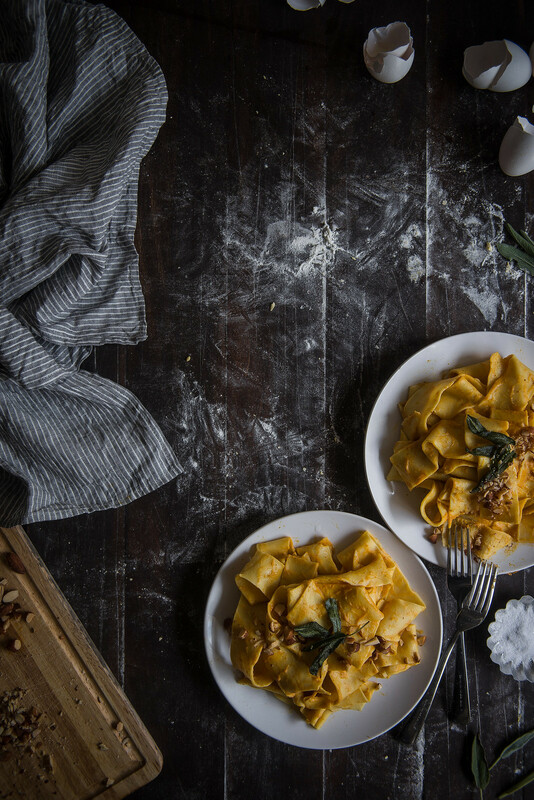 If rolling the pasta by hand, place one portion of the dough on a well-floured surface and roll it out into as large a rectangle as you can manage, then fold the sheet in half or into thirds and roll it out again, and repeat as many times as you're able. This can be tough by hand (though probably tougher for me than it should have been!) so just do it as many times as you can comfortably manage, rolling the pasta sheet as thin as you can each time. If using a pasta machine, see this post for instructions on how to prepare this recipe. To cut the noodles, generously dust the sheet with flour, then roll the sheet up into a log, cinnamon-roll style, and slice using a serrated knife to your desired width. Tajarin is technically a very thin-cut noodle, but I went with wider pappardelle here. 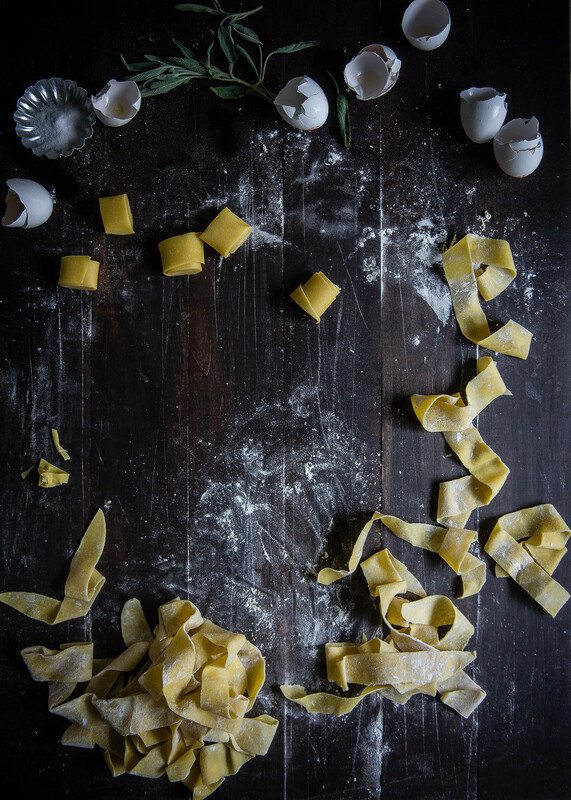 Once sliced, unroll the individual noodles and toss generously in flour to make sure it doesn't stick together. Set aside. Melt the butter over medium-low heat in a large saucepan or wok. Add the sage leaves and cook, stirring, until butter browns and sage leaves are crispy (about 2 minutes). Remove the sage leaves and set aside. Add the kabocha, creme fraiche, nutmeg and cinnamon and stir until smooth. Taste and season with salt and pepper to taste. Turn the heat to its lowest setting to keep the sauce warm while the pasta cooks. Bring a large pot of well-salted water to boil, then add the fresh pappardelle. If handmade, it should take no longer than 1-2 minutes for the pasta to cook. Generally, the pasta is done when the noodles float to the surface. Use a pasta claw or tong to remove the pasta and add it directly to the sauce, letting some of the starchy water come with it. Toss the pasta until well-coated in sauce. If you've turned the heat off, you may want to turn it back to low for this step. Add another ladle or two of the pasta water as needed to loosen the sauce. Garnish with the reserved sage leaves and a handful of chopped walnuts or almonds, if desired. Serve immediately. To make your own kabocha puree, use a sturdy knife to slice the kabocha in half. Lightly oil the cut sides, then place on a baking sheet and bake at 450 for about 40-50 minutes, or until kabocha is tender. Scoop out the seeds and use a food mill or food processor to puree. « bacon & mashed potato pizza // a how sweet baby shower! That sauce looks incredible. I love that it has a dash of cinnamon in it and a nutty garnish. Can’t wait to try it! Thank you so much, Kristin!! The cinnamon was a weird but somehow delightful addition. 🙂 I hope you love it if you try it! There you go again, convincing me to try my hand at what I’ve quietly snuck away from in the past. Pasta-making, here we go. I would not at all blame you for shying away from handrolled pasta 😉 in fact, I was probably super jealous of you when I was in the depths of my pasta despair! But I hope you love it if you try it :):) it definitely is worth it (plus you feel like you burned some calories, woop woop)! Thank you so much for the kind comment, Lindsey!! oh my goodness this looks too good!!!!!! YAYAYYAYYY for the holidays and yay for seeing your family!!!!!!!!!!!!!!! I often use creme fraiche as a quick pasta sauce; I love the richness and tang that it brings. I normally pair it with leeks and garlic and a bucketload of parmesan but I’m really excited to try this version. It sounds so incredibly delicious and I want to dive straight into that bowl of pasta. This looks amazing. I love your photos — they draw the eye immediately to the pasta. I am making this recipe ASAP!! Ah thank you so much, Emily!! This looks amazing. I don’t have a pasta roller either and have been too scared to attempt it without one, but you’ve inspired me. I’ve got muscles! I can do it! The sauce looks amazing. I love Vermonters. They really do take pride in their work. HA yes!!!!!! You can totally do it!!! If I can, you most def can 🙂 And it’s so true — VT-ers are truly inspiring. Thanks so much for stopping by, Amanda! It’s true, you really can’t go wrong with squash + sage! (+ carbs!) And yes, doesn’t everything in the giveaway look incredible?? I want it all! Looks amazing!!! Maybe I should make homemade pasta sometime – you make it seem so easy! This definitely makes me want to try making homemade pasta! I love papardelle! This recipe looks amazing. I can’t wait to try it. The sauce looks so delicious! I don’t make enough homemade pasta! This reminds me I need to do just that. Absolutely gorgeous! Growing up in New England (and living in Vermont for 5 years), you realize there is definitely something super special about Vermont-made, local products. Love love love! As an English lass, I won’t be celebrating thanksgiving but I’m with you on the excitement for Christmas: I’m all preped to get SO MUCH BAKING done and this year I’m doing the Great Food Blogger Cookie Swap, which I’m so excited for! As for the pasta: looks so good. I’ve tried making my own pasta a few times now but I need practice. I’ve also been discovering new squash varieties with delight this year. And yay for pasta making, these are things of beauty! I can’t wait for Christmas cookie making, either! gah!! you’re killing me!! this looks so dang good!! Pappardelle is possibly the best kind of pasta on earth. : ) And I have recently been introduced to kabocha and am hooked – in fact, I’m having some with lunch today. Needless to say, this pasta, with that creamy creme fraiche, sounds incredible! And what a giveaway! This is definitely the best time of year. Thanks! It looks wonderful! Emerson would say, the “marrow of life”. What what omg what. How has this ten egg yolk pasta eluded me until now?!?!!?asd;’l,kjlf!!! This pasta definitely looks worth the effort, I think pappardelle is one of my favorite types of pasta. Gorgeous photos and will check out Vermonters. I love a dollop of creme fraiche on pie, both sweet and savory! This sounds delicious! I’ve never tried kabocha squash before — this might be the way to do it! Whoaaa dang girl dang this sounds so good! This kind of pasta has been one of my total favs lately. I love that brown butter-sage-squash situation. Ugh it’s so good. And how do you always make your photos have such a lovely mood? You’re a wizard. Love super wide cut pasta, not sure how the shape affects taste but tagliatelle or the handkerchief one is soo much better than my two least favorite pasta types: bowtie and elbow. For me, crème fraîchee is best with fresh berries and a bit of lemon or orange zest on a hot evening! Healthy and refreshing. This pasta looks absolutely INSANE. As in, I want to lick the place and get pasta all up on my chin. That was supposed to say ‘plate’. See, I can’t even concentrate. Love me some creme fraiche! And that homemade pasta looks incredible! i’ve actually never tried creme fraiche!! i’ve never seen a recipe using it but if i won, i’d try this! this sounds delicious… it may be my winner recipe for this one Thanksgiving:) so excited! and you are right… creme fraiche are AWESOME! I adore the use of kabocha in this, and the cinnamon sounds amazing! You never cease to amaze me with your seriously creative (and delicious!) ideas! I’ve been searching for a good homemade pappardelle recipe! Kabocha is soooo my favorite squash the last couple years! It seems crazy rich for such a healthful vegetable, and the color is insane. Once I had my husband pick one up from the store for us, and it was like a local, organic squash and it was like FIFTEEN DOLLARS. I almost shed a tear. They are less than a buck a pound at my favorite Asian market! Gah. Anyway, that was some awesome and expensive soup 🙂 Your pasta could not be prettier and I LOVE that crispy, butter-fried sage! Isn’t it tempting to put it on everything? 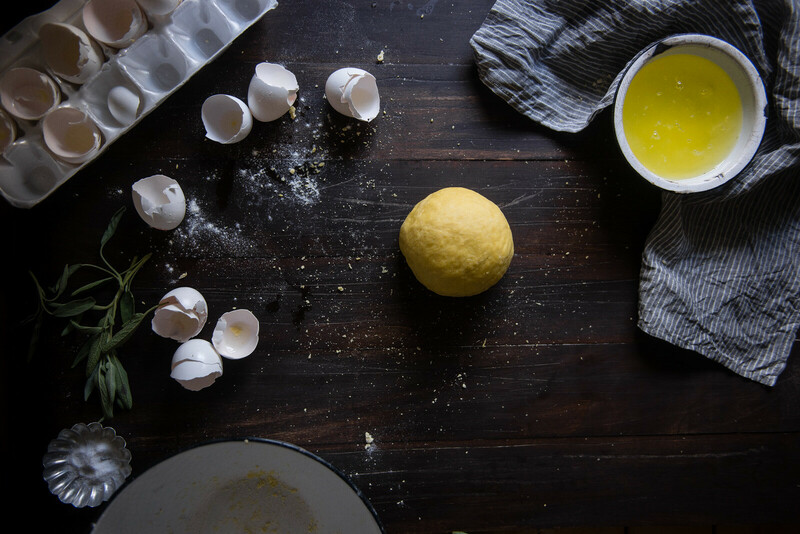 I’ve never seen such an egg-yolk heavy pasta dough…. I am astounded. Must try! Wish you could come over and use my Kitchenaid pasta attachment! Makes quick work of the whole situation 🙁 Your poor biceps. Thanks for going through it for us! I’m a sucker for sage and squash. This looks so tasty! I’ve only made pasta once and man it was tough, I feel you! Hohoho–I am ALL about seeing those wide yellow strips bobbing up to the top of a merrily bubbling pot! I just can’t wait for this pasta and all those holiday cookies to ramp into full gear in a few weeks. Happy Wednesday, Cynthia! Wow! This looks fantastic,and I’m adding it to my “must make” file. This year we are having Thanksgiving at our house, and my parents are coming into town. You make the most beautiful pasta, this is just gorgeous! Firstly – I can’t BELIEVE you rolled this pasta by hand! Your guns must be Michelle Obama level amazing by now, because these noodles are perfect! 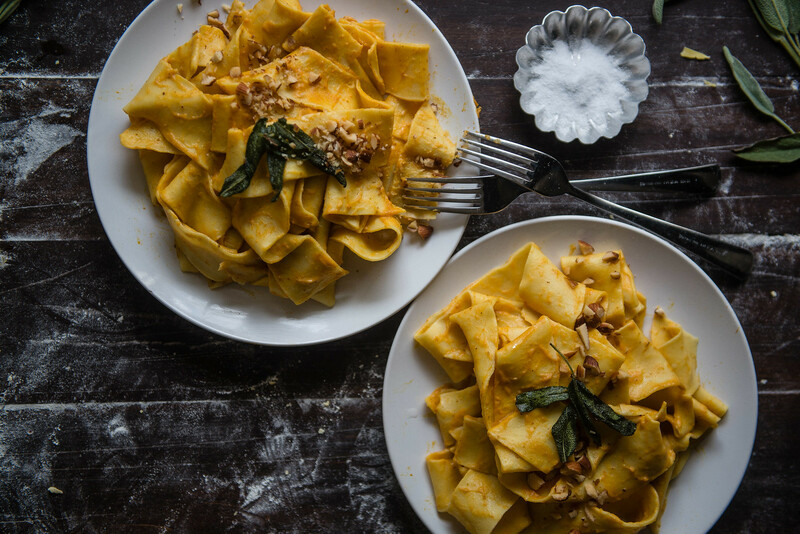 Secondly – Squash pasta with sage is one of my absolute favourite, favourite, favourite things to eat and this looks like an incredibly silky, delicious version! Thirdly – thanks for the sides-a-palooza shout out, lovely lady! This pasta looks so yummy! 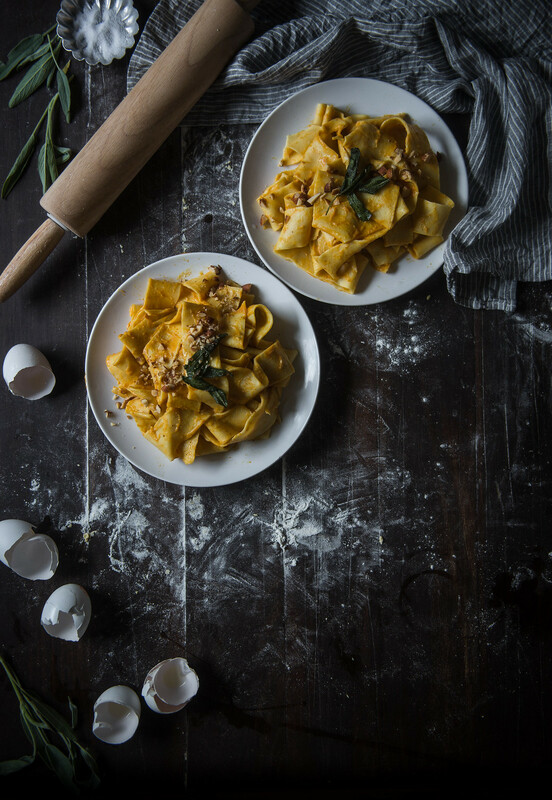 I love pappardelle, and I love the flavors you paired together! Such a great fall dinner. beautiful photos – this looks amazing! This pasta. This giveaway. This amazing world we live in where you can win actual dairy products online. I love this life, please don’t ever stop. I’ve always been terrified of homemade pasta, so I can understand your frustration. But what came of it is gorgeous! Those noodles are perfect, especially topped with that sauce. Lovely! This looks AMAZING and the photos are STUNNING! Damn girl, great job! Yum! That pasta looks like something I would curl up on a sofa with watching bad TV and keeping warm in this cold weather. I personally like creme fraiche in a ramekin with an egg baked with some dill. It is so simple but so delicious! i’ve never made my own pasta – why?? i heart kabocha! mmm i love how easy and beautiful roasted squash is. Beautiful dish! As a fellow pasta making machine-less chef, I’m with ya … it’s a labor of love but so worth it. We’ll definitely be trying this over at TBAFP’s kitchen. I have a Belgian style golden ale that it would pair perfectly with. Thanks! Delicious! Thank you for posting!! This looks absolutely lovely- I adore kabocha! You haven’t seen your family in over a year? Wow, that must be so hard; at least it would be for me (I’m such a family person myself). So YAY to holiday season and to seeing your family again!! Beyond happy for you, Cynthia! Your pasta looks gorgeous! I admit that when I make fresh pasta, I bring in Mr. Fox to do the heavy kneading. I’ve been playing with kabocha as well, but I’ve been finding it very sweet. Can’t wait to try this recipe and see if the creme fraiche cuts through the sweetness. This looks so tasty! I’ve never made pasta before but I’m anxious to try this recipe. Your recipe looks divine. My crème fraîche recipe is using a similar wide noodle (though not quite so wide, more like linguine noodle) some salmon, the crème fraîche and real fresh peas (which Trader Joe’s usually has). 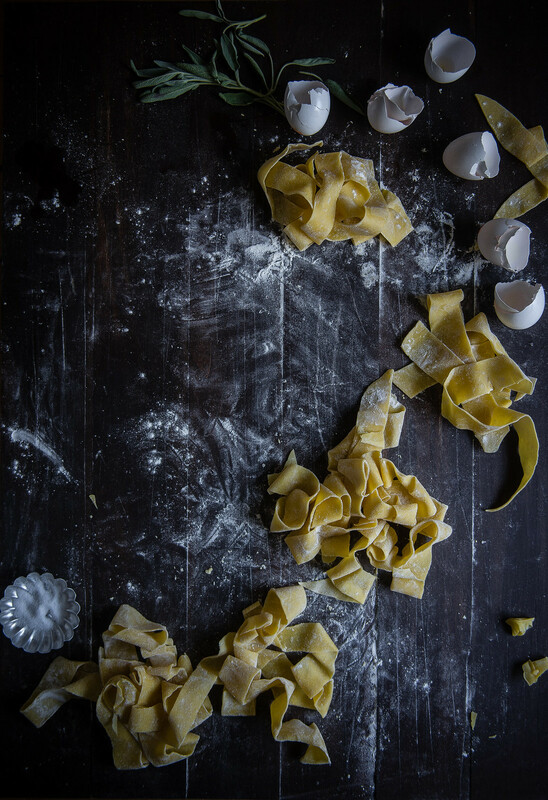 There’s nothing like homemade papardelle! It’s a my absolute favorite pasta~ Your photography is so beautiful and delicious! I’ve long wanted to try kabocha and this would be the perfect recipe to do so. Looks amazing! I love making homemade pasta and just today I made a kabocha squash soup. I definitely want to try your pasta sauce-the perfect fall meal! Exactly the sauce I’ve been looking for! This Sunday’s dinner…! 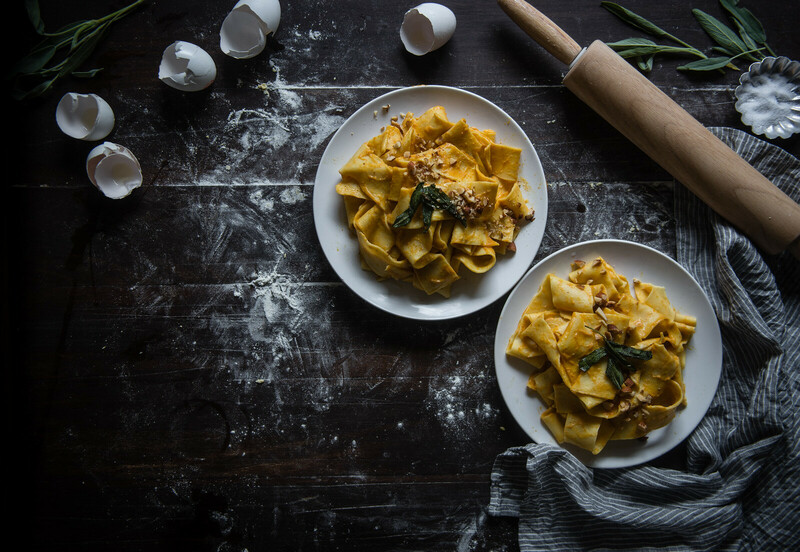 Your homemade pappardelle is totally wonderful. I hope I can muster my courage to make my own homemade pasta someday, especially to make it without using any pasta maker!! !… Bravo!!! Love all your photos as ALWAYS, Cynthia cause I usually leave your page drooling for your food, oh and by the way, so happy you get a chance to fly home soon. Yay!!!!!! This looks wonderful and just perfect for this time of year!! I don’t think I’ve ever had anything like this, but I definitely want to change that! Pappardelle is my weakness! The fatter the noodle, the more I love it. This sounds fabulous. I still haven’t tried kabocha squash! That looks amazing! And I love how the egg shells are placed in the photos! I’ve been considering investing in a pasta roller, not sure if I need another gadget! But you’ve convinced me that I could do without one, you’ve done such a beautiful job making these. The recipe makes me want to bust out my pasta maker! I’m doing a traditional Thanksgiving spread with a roast turkey, lots of sides, and an italian cream cake for one of the desserts. This recipe looks divine! For Thanksgiving, I’m planning a traditional (but still relatively healthy) spread for my family, friends, and myself. 20 people in attendance this year. This looks amazing but I think I will go for a pasta machine. I’ve always wanted one anyway. I just came across your blog this afternoon, and I am so excited to explore your gorgeous recipes! This pasta looks phenomenal! I can’t wait to give it a try. Wow!!! This looks so delicous! Totally making this soon! The recipe looks absolutely lovely, and simultaneously elegant and comforting! Moving this to the top of my recipes-to-try list! Looks amazing. Thank you for totally commiserating with my pasta creating struggles. This post is so on point, it’s crazy. This looks amazing! I love creme fraiche, but I must confess that I rarely use it. Perhaps this will change my mind! My husband just loves pappardelle. I bet that would be really good with leftover dark meat turkey and sage! This is mouth-watering beautiful… wish I had some to eat right now! Pappardelle is seriously my favourite pasta. Yours looks incredible, Cynthia – absolutely perfect! And these photos are gorgeous. I’m always in awe of how you take such beautiful, artful process photos. And I feel ya girl, on the holiday high. I’m always happy from October to December because of all the fun and the amazing food-binging! Bring on the stretchy pants! oooooh I just made fresh pasta for the first time this last weekend! Now, I am dying to try more. This sounds really amazing. Vermont Creamery Creme Fraiche is my secret weapon in my mashed potatoes. Always!! Some of my favorite food memories are of travelling to Vermont in late summer, and eating Vermont Creamery Creme Fraiche on locally baked artisan bread with slices of organic apple and a drizzle of raw honey, ok- and maybe a little almond butter swipe here and there! It was the most delicious creamy taste and texture I’d ever had, (and I’m from Wisconsin! a fellow dairy state!) and I was hooked, a perfect addition to a post-hiking or skiing day outdoors. I’ll be serving bowls of organic roasted beet borscht as a light soup course during the holidays, and the deep red color of the beet broth, combined with fresh green herbs on top of a dollop of Vermont Creamery Creme Fraiche is going to be a cheerful, nourishing reminder of this holiday season’s color palette. Thanks for reminding me of this great foodie staple! This looks amazing! Kabocha is my favorite kind of squash, and I bet it would be great with all the other flavors you have here. I don’t have a pasta machine either, and have never been brave enough to try making it by hand… really impressed at how nice the picture looks.